David Unger’s The Mastermind as re-envisioned by his wife, the artist Anne Gilman. 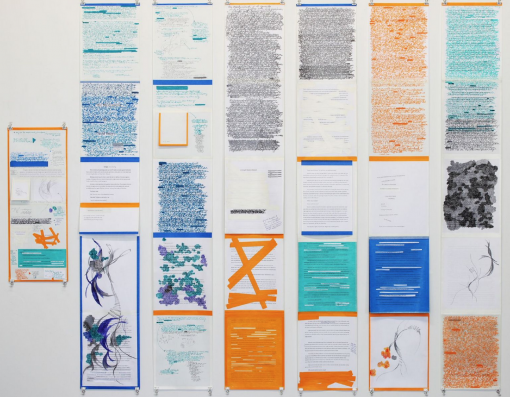 The Center For Book Arts in New York offers a matrix for re-envisioned book-making as fine art. Current exhibitors, author David Unger and artist Anne Gilman, explain. As “The Death of The Printed Book” continues to be mourned loudly and often – although most experts would point to the fact that print-books are a) still selling and b) not going the route of print-newspapers any time soon – “Book Art” seems to be enjoying a sort of reification. This is not so much a book as l’object d’art — such as a fine-press, limited-number editions, or something from the Folio Society — but rather, a re-use of a book into an entirely new piece of art. Hence, The Center For Book Arts on West 27th Street in New York City’s r’aison d’etre, a matrix of tradition and experimentation in book-making, as well as what can be re-envisioned as a “book” and book art. Sarah Nichols, who has been with the Center for over a dozen years, describes it as a combination “gallery and studio that fosters the art of the book.” Founded in 1974 by book artist Richard Minsky, the Center’s current Executive Director and Curator is Alexander Campos has continued Minsky’s mission of book binding, broadsides, paper decoration, and chapbooks. It is also very much a teaching space with classes and intensive workshops and lectures. One current example of exhibitions is “Zines+ and the World of ABC No Rio,” a wide collection of Lower East Side ‘zines — that is, cheaply-made and priced serials as well as a clutch of courses ranging from book binding and paper cutting to asemic writing and draft-notation. Among the other exhibitions on display at the Center — as part of their Livre d’Artiste d’Aujourd’hui series — is a collaborative work by a husband and wife team, David Unger and Anne Gilman. This whimsical, playful yet deceptively deep display is based on Unger’s novel (in manuscript form) entitled The Mastermind. 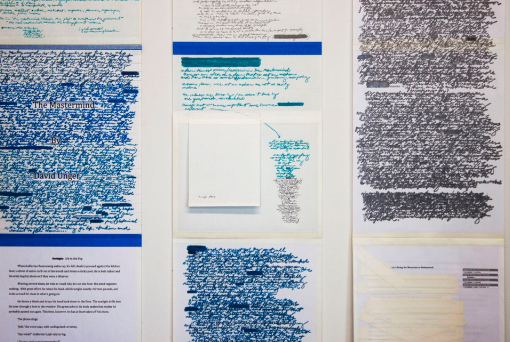 Gilman has taken that manuscript and broken most of it open: on a wall she’s taped some pages (reminiscent of Mondrian), redacted other pages, re-connected more pages, and, in a tour-de-force of “concrete-fiction” encased the manuscript so is displayed on the wall — and bolted it together (literally) — creating a sort of diptych of an open work. An open work that is bolted down—but with a see-through cover, like a Ferrari F40 super-car whose engine you can view through plexiglass while it hums at 9000rpm. And the work entitled The Mastermind y lo contrario is tactile, too; it is meant to be touched, pages lifted. There is even a “key” or “legend” which, depending on your point of view, is either a guidebook or an example of the Intentional Fallacy. In one of those serendipitous moments that artists live for, Unger — who is also the North American representative the Guadalajara Book Fair — had just finished his manuscript and Anne, at Campos’s behest, asked him if they could use it “as a substrate for this project.” “And I thought that was great,” says Unger, author of several works of fiction, many of them published in his native Guatemala. “We had collaborated over twenty years ago when I wrote a poem ‘The Girl in the Treehouse’ — a long narrative poem — and Anne created original lithographs that took nearly two years to complete…it’s a huge children’s book, but for adults.” [It’s in the collection at the Brooklyn Museum]. 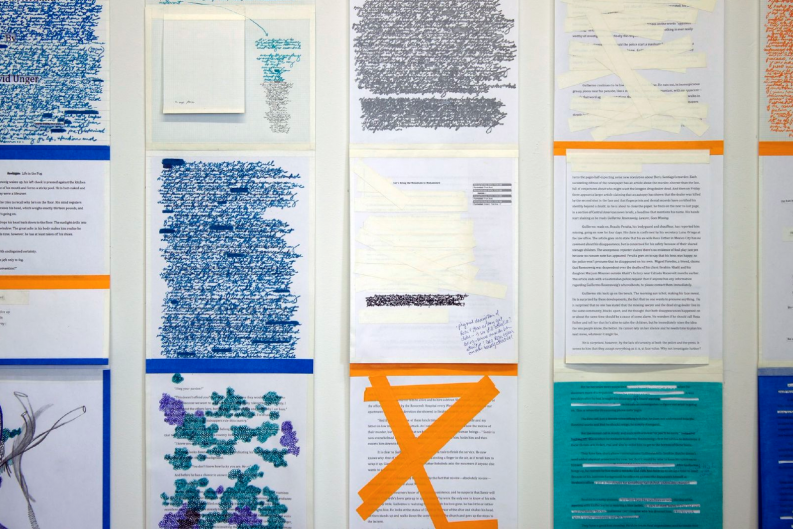 “Alex wanted a real collaboration—not just an artist’s response to the written work.” Unger had “a lot to say with the format and decision-making in general” when it came to how his The Mastermind, would be “re-vised” on The Center For Book Art’s Wall. And David responded “If the mastemind is the ‘alpha male’, y lo contrario’ is someone who can achieve the same goals as the mastermind but without power, control, or manipulation—which are other themes in the novel”. For all that is going on in The Mastermind y lo contrario, one never feels like the artist (or the writer, for that matter) has lost control. It’s not abstemious, exactly: there is certainly a lot of “free-play” and interaction. But there is also much “redaction, deletion, and over-writing” as Unger pointed out. 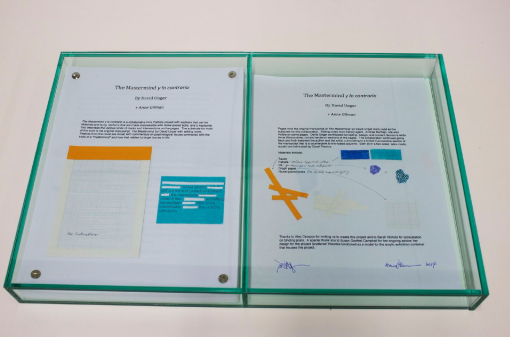 There’s also a musicality about it: the work, when removed from the wall, folds like an accordian and fits perfectly into the aforementioned display case, right next to the half of ms that is bolted together. This is less a work about duality, but more of an almost Eastern yin-yang “each-is-both” intersection of discourses. “David is much more direct and I tend to take a more circuitous route” Gilman added. The eye is drawn all over The Mastermind, but for its many detours, it’s never lost. The Mastermind is a triumph of, if not Book art, then art. Period. The Mastermind y lo contrario by Anne Gilman and David Unger is The Center For Book Arts in New York City. The exhibition will be travelling to MDC Galleries of Art + Design in Miami from November 17th, 2014 to March 20th, 2015, where it will be included as part of the Miami Book Fair.